This option calculates the residual lots left after a proposed road has been designed through the allotments. Enter the lots that are affected by the resumption in the LOTS folder. Lots that are not affected need not be removed. Calculate and enter two strings that define the left and right edge of the road. in the initial subdivision file there can be no curved boundary's. 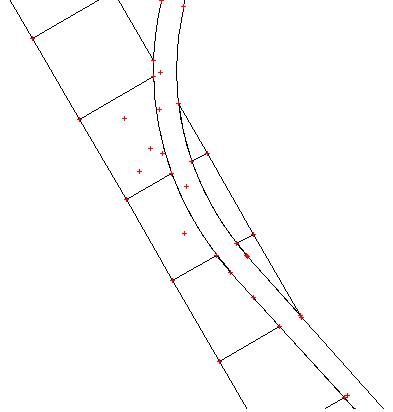 After processing the subdivision can have curved boundary's if road edges are curved. The road alignment runs from the bottom of the screen towards the top. By inspection we can see the area's that are to be retained.We just need to get the program to calculate these new area's for us. From the "Cogo" menu select the "Resumptions" option. You are presented with a dialog where you select or pick the left road boundary and also the right road boundray. 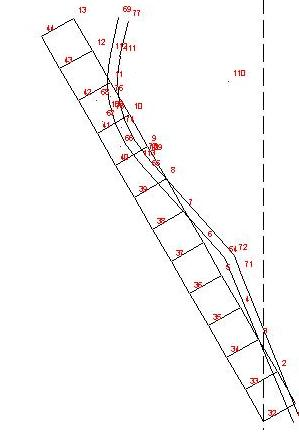 If for example you only wish to retain lots on left side of the easement then do not select a right boundary. Clicking OK runs the option and does the following. Any strings in the "lots" folder are checked for intersections with the left and right boundary's. A copy of the original string is placed into the "lots_backup" folder.